Hiroyuki Tetsuka didn’t get the start he wanted at the beginning of 2018 but he capped the year off in much better fashion in the main event of Pancrase 302. 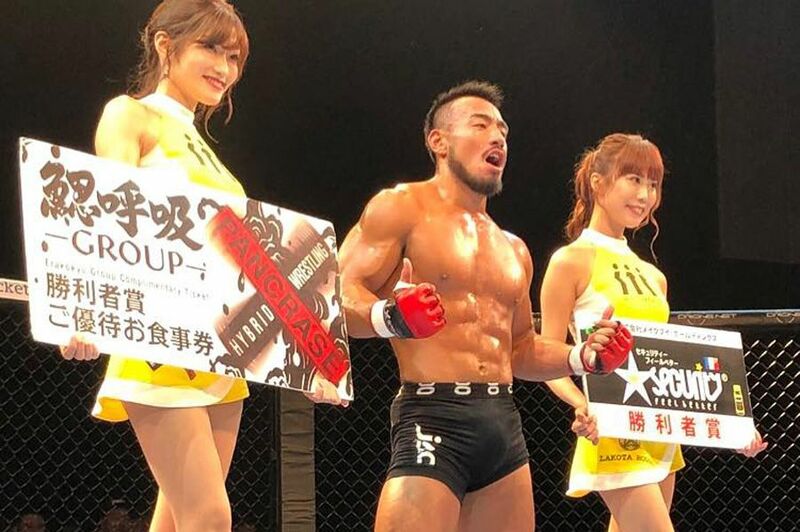 After falling to current welterweight champion Glaico Franca in a razor close split decision back in February, Tetsuka returned with a vengeance to earn a TKO in August before booking his final fight of the year against veteran Akihiro Murayama. Tetsuka knew going into the fight that a win could put him back into that title picture and a potential rematch against Franca in 2019. Perhaps the most disappointing part of the entire fight for Tetsuka was that he just couldn’t find the right combination of strikes to put Murayama away, although he showcased a wide variety of his skills over the course of the fight. Time and again, Tetsuka was stalking Murayama across the cage, tossing out a strong lead jab and then following up with a huge right hand behind it. Tetsuka definitely wanted the knockout but Murayama was playing defense all fight long, just trying to avoid those big looping shots coming from the top ranked welterweight contender. As time ticked away into the second and third rounds, Murayama was desperate to get the fight to the ground but he wasn’t setting up his takedowns and Tetsuka easily shrugged him off to return the action to the feet. From there, Tetsuka (6-3) started chopping away at Murayama’s foundation with a series of stiff kicks to the legs. Late in the fight those leg kicks paid off as Tetsuka was able to fire one off and then follow with his punches that consistently clipped Murayama (20-9-9). 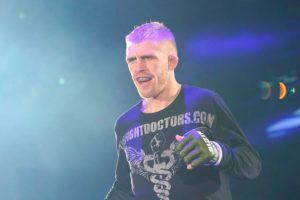 Time ran out on Tetuska before he could get the finish and his frustration was obvious after a dominant showing that didn’t end with the knockout. Still, considering the kind of performance he had at Pancrase 302, it’s going to be tough to deny Tetsuka at worse a No. 1 contender’s fight when he makes his return next year. 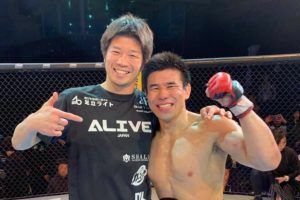 For the second time in two years, Masatatsu Ueda earned a victory over Toru Ogawa but the ending of their rematch was very different from their first fight. Back in 2017, Ueda edged out Ogawa by split decision at Pancrase 289 but the rematch came to a dramatic conclusion in the second round at Pancrase 302. Ogawa aggressively pursued Ueda around the cage, launching his striking combinations while being careful not to get baited into the takedown attempts from his opponent. Ueda appeared to be waiting for just the right moment to open up and lunge forward for the takedown but he couldn’t quite get his timing down. That all changed in the second round when Ueda seemed happy to exchange strikes with Ogawa, but that was only giving him a false sense of security. After finally working his way off the cage way where he spent the majority of the fight, Ueda uncorked a hellish right kick that connected shin to face and sent Ogawa crashing down to the mat. Ueda (16-3-2) followed up with another punch as the referee quickly rushed into stop the contest with Ogawa (10-7) stiff as a board as a result of the vicious knockout. Ueda has plenty of big wins on his resume but this might be the best finish of his career after slamming home the stunning knockout to win at Pancrase 302. In a featured women’s flyweight fight, Brazilian Sidy Rocha (10-5-2) ended her bout against Mariya Suzuki (1-2) in devastating fashion with a brutal ground and pound TKO in the second round. Rocha showcased a strong grappling game throughout the first and second rounds, never allowing Suzuki a second to breathe as she constantly played defense from the bottom. The end came in the second round after Rocha advanced her position past Suzuki’s guard and moved into the mount. A split second later, Rocha was raining down fire on Suzuki with a series of punches that just chipped away at the Japanese flyweight until she could barely defend any longer. After several unanswered left hands crushed Suzuki, the referee finally stepped into stop the contest with Rocha earning the victory in her Pancrase debut. Pancrase 302 will serve as the final card of the year for the promotion with ambitious plans expected for 2019 with 11 shows in the works.